OpenNebula 2.2 (Codename Cat’s Eye) Released! Today, the OpenNebula project announces the general availability of the final release of OpenNebula 2.2.0. This is a stable version and it is targeted at production deployments. Clouds running any OpenNebula 2.0.x versions are recommended to upgrade to this release. Among the new features, OpenNebula 2.2.0 includes Sunstone, a web application to control your cloud with lots of eye candy. 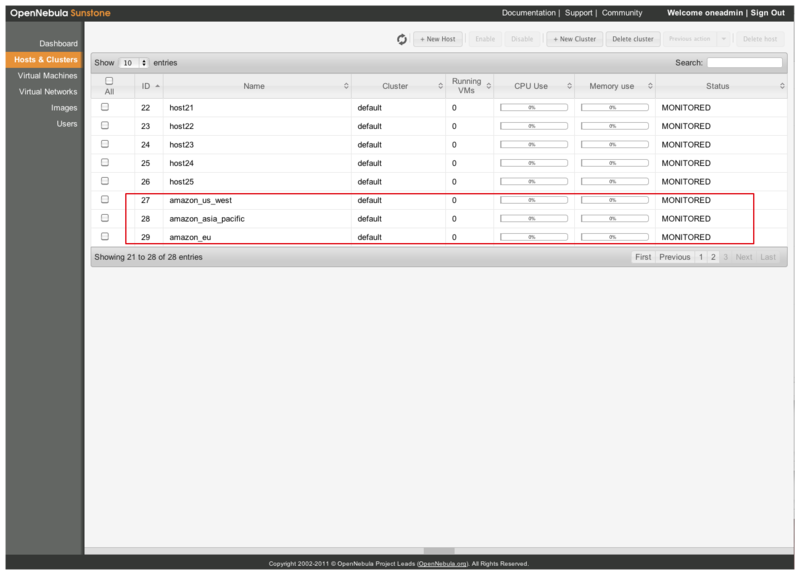 OpenNebula 2.2.0 also brings important new features in the fault tolerance and scalability areas. OpenNebula 2.2 is the seventh major release of the project and with it, it continues to fulfill the promise of building a state-of-the-art open source toolkit that also addresses the scalability, flexibility and security requirements of large-scale production systems. As usual OpenNebula releases are named after a Nebula. The Cat’s Eye Nebula (NGC 6543, Caldwell 6) is a planetary nebula in the constellation of Draco. The OpenNebula project would like to thank the community for their effort and valuable contributions that have made possible this release; the European Commission for founding part of the developments of this release through the StratusLab and BonFIRE research grants; and our private sponsor, C12G Labs, for supporting the community and software contributions. https://opennebula.org/wp-content/uploads/2018/11/opennebula_cloud_logo_white_bg-4.png 0 0 Ruben S. Montero https://opennebula.org/wp-content/uploads/2018/11/opennebula_cloud_logo_white_bg-4.png Ruben S. Montero2011-03-28 23:10:062011-03-28 23:10:06OpenNebula 2.2 (Codename Cat's Eye) Released! The March edition of the Internet of Services newsletter features OpenNebula as spinoff of RESERVOIR. This newsletter reports about the activities of the Software & Service Architectures and Infrastructures Unit in the Information Society Directorate-General of the European Commission. The article highlights the innovation and interoperability of OpenNebula and its high number of downloads and adoption in production environments. OpenNebula is being used as reference open stack for cloud computing in many large research and infrastructure projects. As you probably noticed, last week we migrated the OpenNebula community services (web pages, development repos…) to a new infrastructure to accommodate the quickly increasing number of visits and downloads. As a result the RC announcement did not hit the list, the software was available, though. OpenNebula 2.2 RC1 is the last development release of the OpenNebula toolkit. Although OpenNebula RC1 is targeted at testers that would like to check the exciting new features of OpenNebula 2.2, it is considered stable enough for daily operations. OpenNebula 2.2 RC1 adds general stability, and performance improvements as well as the features from previous OpenNebula 2.2 Betas. OpenNebula 2.2 RC1 is backward compatible with the 2.x series in terms of the database schema, interfaces and API’s. We really appreciate the work of the community testing the previous release and giving feedback about issues and bugs. Thanks! As an open-source community partially funded with public funding, it is very important for us to keep an updated list of organizations and projects using OpenNebula. Doing so puts us in a better position to get grants and keep OpenNebula well funded through a combination of public and private funding. If your organization or project is not listed in our Users and Projects page, and you would be willing to be listed, please fill out this really quick form or contact our community manager. Details of your OpenNebula deployment are welcome, but not strictly necessary, as we know it is often not possible to reveal this information publicly. Just allowing us to list the name of your organization on the Users and Projects page would be enough. https://opennebula.org/wp-content/uploads/2018/11/opennebula_cloud_logo_white_bg-4.png 0 0 Borja Sotomayor https://opennebula.org/wp-content/uploads/2018/11/opennebula_cloud_logo_white_bg-4.png Borja Sotomayor2011-03-18 16:20:102011-03-18 16:23:54Are you using OpenNebula? OSLO, Norway, March 10, 2011 — Cfengine, the technology leader in datacenter automation, and C12G Labs, the leader in private cloud computing management, announced today the availability of integration between Cfengine Nova and OpenNebulaPro for the automatic creation and management of virtualized data centerand cloud environments. The connection between both state-of-the-art technologies allows companies to easily and quickly define, install and configure new physical resources and to automatically create and scale the services running in the cloud. OpenNebulaPro is the supported and certified enterprise-grade distribution of the widely used OpenNebula toolkit for cloud computing. OpenNebula is used by thousands of organizations to build large-scale production public and private clouds using KVM, Xen and VMware, and hybrid clouds using Amazon Web Services. The cloud management tool includes features for integration, management, scalability, security and accounting that many enterprise IT shops need for cloud adoption. Cfengine Nova is a cutting-edge enterprise solution for managing IT operations. It is designed with the importance of IT and business alignment in mind and has a direct positive impact on business performance. This is achieved through a state-of-the-art overview of IT resources, allowing for maximum transparency and ensuring compliance. Cfengine Nova has been adapted to the growing need for agility and allows for a quick response to new business initiatives. Several thousands of companies have realized the benefits of Cfengine and have implemented it on millions of machines worldwide. OpenNebulaPro and Cfengine Nova are both the result of many years of research and development to address enterprise system management challenges in large-scale data centers. Their combination brings real innovation to the market by providing an easy, agile and consistent setup and operation of cloud infrastructures, ensuring the correct running of all the involved layers in an Infrastructure as a Service setup. Many companies, and especially Fortune 500 companies, are in the process of evaluating cloud computing technologies in a quest to decide whether the claims of this technology are legitimate or not. The benefits of this partnership for these businesses include cost savings in hardware and in management of infrastructure and services. The Dutch Supercomputing Centre SARA (StichtingAcademischRekencentrum) is one of the top 500 supercomputing sites in the world. The organization has implemented a combination of Cfengine and Open Nebula and offers its cloud services to the Dutch community of scientists, ranging from ranging from bio-informatics to linguistics. The use of OpenNebula allows these researchers to operate their very own virtual private HPC cluster, with fully autonomous configurations and on-demand scalability. Cfengine ensures security and adds versatility to the project, very easily supporting continuous improvements and rapid expansion. C12G Labs, the leader in private cloud computing management, is the company behind the OpenNebula open-source toolkit for cloud computing. C12G provides enterprise-grade solutions around OpenNebulaPro, which is a stable, certified, and supported distribution of OpenNebula. C12G offers a comprehensive set of services, through which customers and partners can get production level support or build a custom cloud. Cfengine, the world technology leader in datacenter automation, is based on state-of-the-art research and development. Cfengine Nova, the company’s cutting-edge enterprise solution, is designed with the importance of IT and business alignment in mind and has a direct positive impact on business performance. The company has an ambitious road-map for future development, with Cfengine Constellation due to launch in April 2011. Several thousands of companies have realized the benefits of Cfengine and have implemented it on millions of machines worldwide. The RESERVOIR project is organizing an OpenNebula training session in Paris on March 22, similar to the one held in Brussels last January. The training will be given by CETIC and the RESERVOIR project and will take place in La Cantine. RESERVOIR is an IBM-led joint research initiative of 13 European partners to develop technologies that help automate the fluctuating demand for IT resources in a cloud computing environment. To pave the way to adoption of cloud technology by businesses, the RESERVOIR project has integrated a set of virtualization and cloud management tools. The participants will learn about the global architecture of the RESERVOIR Framework, with a particular attention given to OpenNebula. The training will cover the management aspects: installation, configuration and administration. The participants will also learn about the use of OpenNebula, including private, hybrid and public cloud topologies. The course includes hands-on exercises to be performed using attendee’s laptops. This event is free of charge, but you must register by sending an e-mail to reservoir@cetic.be as attendance is restricted to 20 persons. Thanks to the hybrid cloud computing functionality offered by OpenNebula, external clouds are seen in an OpenNebula system as other local resources. In this way, Sunstone allows the management of all the public clouds that are used in the hybrid configuration of any given enterprise. This setup is shown in the screenshot, where a private cloud is shown with associated external resources (in this case, three Amazon availability zones), where the compute power can be outsourced during peak demands. The TCLOUDS project organized a hands-on tutorial about OpenNebula in a meeting in Lisbon, on January 19, 2011. TCLOUDS is an integrated research project financed by European Commission’s FP7 on trustworthy cloud infrastructures and the partners from the University of Lisbon’s Navigators team presented a tutorial to introduce OpenNebula through a user perspective. OpenNebula components were presented, along with their interactions and interfaces. The participants were able to deploy, use and remove virtual machines in a virtual network. The tutorial used an OpenNebula infrastructure installed in the premises of the University of Lisbon. More advanced features were addressed in the same meeting, in two other technical presentations about OpenNebula. 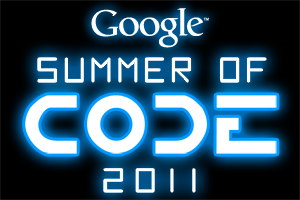 After our successful participation in last year’s Google Summer of Code, the OpenNebula project will once again be applying to be a mentoring organization in Google Summer of Code 2011. As part of our application, we are compiling a list of possible student projects for this summer. We’d like to encourage members of the OpenNebula community to suggest project ideas and to volunteer to mentor students this summer. If you have an interesting project idea, or would be interested in mentoring an OpenNebula student project this summer, please send a message to our mailing list. Please note that the application deadline is March 11th, so we need to collect all project ideas before then.